This week’s review, of Fingerprints of You by Kristen-Paige Madonia, comes to us from Brenna Layne, whose bio follows. My mother got her third tattoo on my seventeenth birthday, a small navy hummingbird she had inked above her left shoulder blade, and though she said she picked it to mark my flight from childhood, it mostly had to do with her wanting to sleep with Johnny Drinko, the tattoo artist who worked in the shop outside town. With her very first sentence, Kristen-Paige Madonia paints a vivid portrait of the relationship between a mother and daughter. Judy Blume has called Madonia’s writing “luminous,” “original,” and “compelling.” As far as I’m concerned, if Judy Blume likes something, that’s reason enough to give it a try. As it happens, there’s a lot to love about this impressive debut novel. Madonia tells the story of seventeen-year-old Lemon, who leaves her nomadic mother, Stella, and sets off on a journey of her own. As Lemon seeks out the father she’s never known, she carries her unborn baby, certain that her own child will never know its father. From the hot haze of a Virginia summer to the chaos and color of San Francisco, Lemon embarks on the best kind of odyssey—both outward, into the larger world, and inward, discovering exactly who she is and what matters most. The interaction between quietly rebellious Lemon and larger-than-life Stella will strike a chord with anyone who’s ever felt overshadowed by a parent. Lemon’s struggle to define her life and relationships on her own terms is an instantly recognizable one, and her thoughtful, introspective voice brings it strongly to life. Both wonderfully quirky and sometimes painfully authentic, Lemon’s story is compelling from the first, marvelous opening sentence. 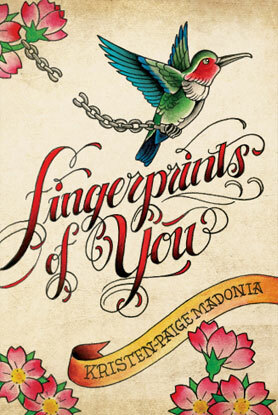 I’ve now read and re-read Fingerprints of You, and what strikes me most is Madonia’s ability to home in on the specific—one girl’s cross-country bus trip—while at the same time telling a classically American coming-of-age story, but with a difference. One of Lemon’s favorite books, On the Road, comes up again and again. Lemon, too, is on the road, but with an important difference—she’s a girl. American literature is full of stories of boys who hit the road, hop trains, see the world. It’s refreshing to read about a girl embarking on this iconic American journey. And it’s powerful. In her search to find where she belongs, not only for herself but for the child within her, she brings a new element of femininity to a familiar and usually masculine theme. With her distinctive voice and wry sense of humor, Lemon is an entertaining narrator. With her flawed yet lovable personality, she’s one with which real teens can identify. But Fingerprints of You, like all the best young adult literature, is a great read for adults, too. The lessons Lemon learns on her journey are ones that we can all use reminding of from time to time. We all leave fingerprints on each other, indelibly marking each other’s lives in ways both great and small. And, as Madonia shows us, recognizing and accepting those invisible tattoos is an unavoidable step in the difficult and beautifully messy journey of growing up. I was fortunate to meet Kristen-Paige Madonia at a local writer’s group shortly after the publication of Fingerprints of You. I’ve met a number of YA novelists over the past few years, but Madonia is the one who really stands out. She was engaged, helpful, and encouraging. I met her at a point in my own writing journey when I was becoming overwhelmed by discouragement. Her kindness and generosity in sharing her own journey—both its ups and downs—was a powerful reminder to me that as writers, we’re all on this journey together, and that no one, no matter how accomplished, has an easy time of it. Like its creator, Madonia’s work is encouraging, powerful, and deeply humane. Not bad fingerprints to leave on the publishing industry, or on the world in general. Brenna Layne writes fantasy novels about young adults because she believes in magic, likes dragons, and hasn’t figured out how to be a grown-up yet. She is currently seeking an agent. She lives in the Shenandoah Valley of Virginia with her family and a growing menagerie of stray dogs, cats, and chickens. She blogs about the intersections between writing and life at www.brennalayne.com. When she isn’t writing, she enjoys beekeeping and broadsword combat.